Mount Bromo Tumpak Sewu Waterfall Tour 3 Days 2 Nights,is a tour to welcomes the morning at Mount Bromo and enjoy the beauty of the Tumpak Sewu Waterfall with a duration of 3 days and 2 nights. Tumpak Sewu or commonly called Coban Sewu is a waterfall with an altitude of about 120 meters with the beauty of a spring that has a unique formation because of the widening water flow located in Lumajang district which is not far from the Bromo Tengger National Park area. Mount Bromo Tumpak Sewu Waterfall 3 Days is the choice for your trip in East Java if you have a lot of time. The combination of a package of trips to an active volcano and to this beautiful waterfall takes 3 days 2 nights. In addition to the tumpak sewu waterfall, there is also a waterfall which is no less beautiful that is not far from the location of Mount Bromo, Madakaripura Waterfall. Read the details here Bromo Madakaripura Waterfall Tour Package 2 Days 1 Night. Intrigued as to what your adventures were when choosing the Mount Bromo tour package program and the tumpak Sewu waterfall 3 days and 2 nights as follows. Mt.Bromo tumpak Sewu Waterfall Tour Package will started after being pick-up by our driver at the Airport, Hotel or Train Station in Surabaya / Malang or places we have previously set. Breakfast first in the lodging. Toward tumpak sewu waterfall lumajang. After Done in these three places then return to the homestay, shower and then prepare to go to the Mt Bromo area for about 5 hours drive. You could chose accommodation near to bromo with stay overnight. You will get up early morning at 2:30 am for the preparation of the bromo sunrise tour, at 03.00 am you leave the hotel by using 4 WD Jeep Bromo to Mount Penanjakan / Kingkong Hill View point 1 which is the purpose of seeing the sunrise in this area to take picture and watch the sunrise. From the beauty of Bromo Sunrise you will see the highest mountain in Java, Semeru Mountain which releases gas of smoke every 20 minutes. Once satisfied with the sunrise, return to the jeep and will take you to the second location of Bromo Crater. Jeep Bromo will park 1 km before Bromo crater. From the Jeep parking lot you can walk or use rent horse service to the ladder on the next bromo mountain you will pass 250 steps to the lips of the crater. After returning from the crater, the jeep will take you back to hotel. Have breakfast, take shower and loading your bags.Transfer to Surabaya or malang for about 3 hours driving. Bromo tumpak sewu waterfall tour 3d2n have finished. Please contact us for The Price of Mount Bromo Tumpak Sewu Waterfall Tour Package 3 Days 2 Nights. 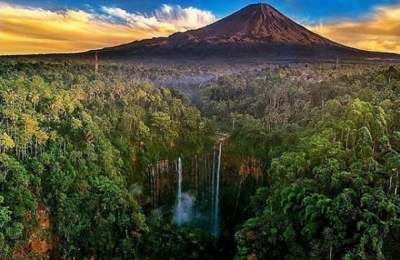 Tumpak Sewu waterfall is considered as the most beautiful waterfall on the Java island and even throughout Indonesia, has a unique formation and perfect when viewed from a height place. Tumpak Sewu waterfall has a height of approximately 120m and located at an altitude of 500mdpl, the flow of water is swiftly sourced from Mount Semeru, the highest mountain in Java.This tour will invite you to visit this most beautiful waterfall in Java and bromo volcanoe for 3 days 2 nights.